I am posting yet another Indonesian dish. It has been an Indonesian cuisine fewer at our house lately. Sambal Goreng (pronounce some-ball go-rang) is a Javanese dish made of sambal (spicy chili condiment) that is stir fried with other herbs and spices for long minutes before coconut milk is added to it. 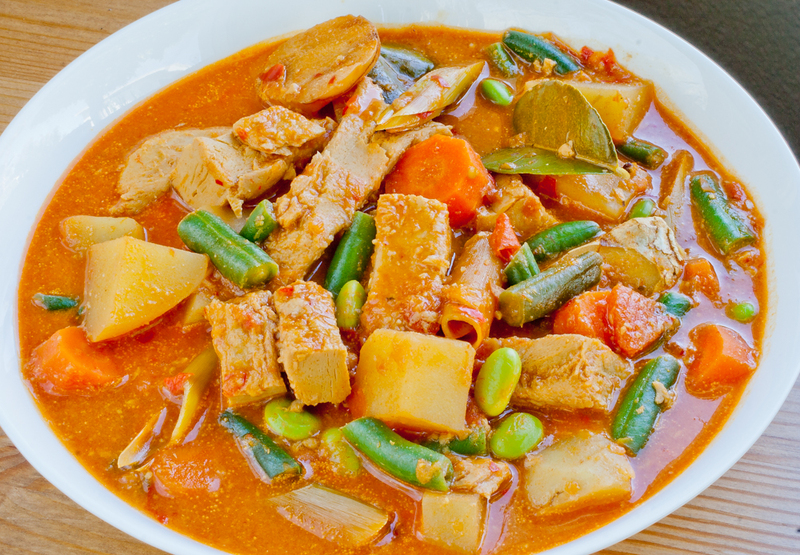 It is a stew curry like Thai panang or red curry. The traditional ingredients are not vegetarian (except sometimes we use potato) such as chicken livers, gizzards, etc. Items that are kind of gross to vegetarians. Sometimes people use shrimps and fish also. The Javanese also use terasi or shrimp paste. Therefore, a vegetarian has to be careful in eating Indonesian curry that has no meat in it since shrimp paste may still be used. I veganized it without using shrimp paste or meat by using potato, carrots, green beans, and edamame. I also use miso to replace the shrimp paste. Tofu and tempeh can also be added to it. This time I incorporated Beyond Meat just because I just want to try cooking with Beyond Meat. I love to experiment and try new things. I am fine with eating tofu and tempeh but I love to venture to other options that are available to vegans. It was not easy to get my hands to Beyond Meat. I first heard about it from Phoney Baloney's when they still have their sandwich business. They made delicious chick'n sandwiches with this product. For a long time Beyond Meat is not available to retail consumers like me. Only just recently that it is available in Whole Foods in retail packaging. However, I didn't buy it from Whole Foods this time. I bought the 5 lbs. package of unseasoned one from Viva La Vegan Grocery. It's a long drive for me to get to Viva La Vegan Grocery. However, it was well worth it. Not only I was able to shop for vegan stuff WITHOUT LOOKING AND CHECKING INGREDIENTS (how awesome is that?) but I also got to eat at Vegan with Joy (the vegan deli inside this grocery store). The food at this deli was really good and the grocery was large. It was an awesome visit to this place. Now, about this dish. I use the same herbs I used in making the Vegan Indonesian 'Lamb' Curry but I used less spices and a milder spice, coriander. I did use fresh chili and controlled the spicyness in my guidance title 'About the level of heat' in this blog. The dish below looks red and spicy but it is not that hot. Put all spice paste ingredients into a food processor, mini chopper, or blender. Grind until it becomes a paste. Add a little bit of chili soaking water to make it easier to grind. Heat a large pot or wok in medium high temperature. Add 1-2 tablespoons of oil. Add the spice paste. Stir fry the sambal or spice paste for about 10 minutes. Add a little bit more of chili soaking water if it sticks to the wok or pot. Add all of the fresh herbs ingredients. Then, stir to combine. Add tofu, tempeh, or Beyond Meat, diced carrots, diced tomatoes, and diced potatoes. Add miso. Add 1 cup vegetable broth and more of the chili soaking water until it barely covers the ingredients but not too soupy. Simmer and stir to combine with the spice paste. Add salt, brown sugar or palm sugar, and the coriander. Continue simmering and stir frequently about 20 minutes or until carrots and potatoes are done but still firm. The tomatoes should disintegrate some at this point. Add coconut milk, edamame pods, and green beans. Taste and add more salt, sugar, and the tamarind water or a few squeezes of lime, if using. Combine and simmer for another 5-10 minutes. This dish is better served the next day when all the spices and herbs are absorbed to the ingredients. Before serving, remove all the fresh herbs ingredients out of the curry. Serve on top of steamed rice, sprinkle with fried shallots, and eat with chips on the side. It's delicious served on top of steamed rice, accoumpanied with chips(krupuk). Using the chips to scoop rice and curry is a yummy way to eat this dish. 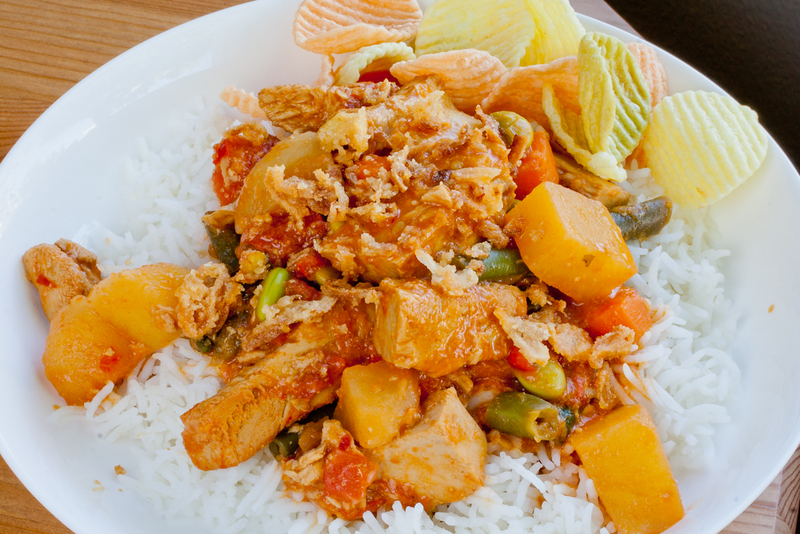 When I lived in Hong kong, I had a domestic helper from Indonesia and she often cook vegetable curry for dinner, although I believe that curry was eaten as a breakfast in Indonesia. It was so good with all the yummy vegetables in coconut flavored curry. I don't remember seeing miso in the curry and I am quite curious how it tastes. Your curry sounds really delicious and I want a plateful right now! Thanks for the recipe!